University of Montana Ph.D. 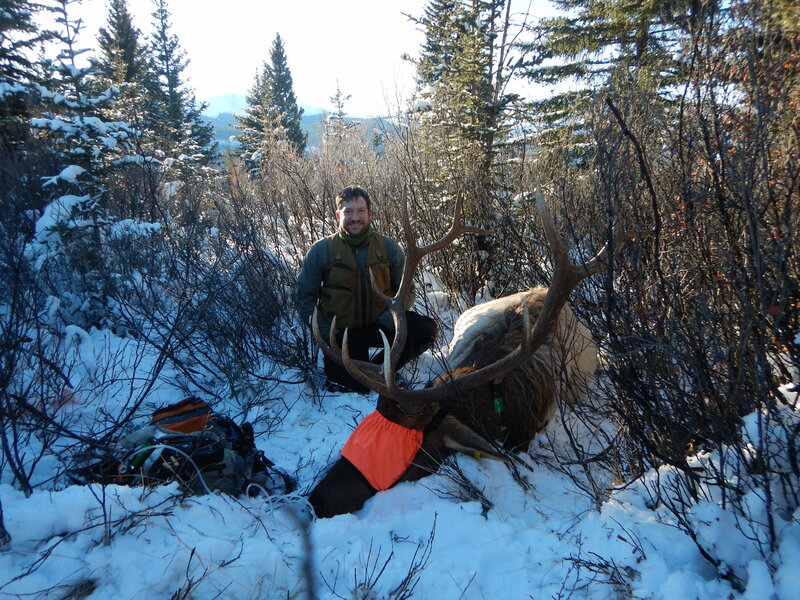 Candidate Hans Martin after successfully capturing 5 bull elk. January 4, 2018. Thanks to support from SCI Foundation and the Hunter Legacy Fund, researchers with the University of Montana successfully collared five bull elk in Alberta’s Ya Ha Tinda herd. Bull elk studies are extremely rare in wildlife biology, and the new phase of this project will be the first ever in an ecosystem influenced by an intact suite of recovering predators, including grizzly bears, mountain lions and wolves, and hunter harvest. The capture field season is ongoing throughout this winter. The Ya Ha Tinda elk herd is representative of many in North America, with a migration pattern across a combination of public, protected, and private land uses. This herd is also one of the most iconic in Canada, offering high quality accessible hunting opportunities. Some of Alberta’s largest bulls have been harvested out of the Ya Ha Tinda, which unfortunately has declined from about 2,200 to 500 elk over the past two decades. The “Persistence of the Ya Ha Tinda Elk Population” project began over 15 years ago with the goal of studying the longterm sustainability of the herd. SCI Foundation began supporting the University of Alberta’s work in 2013, and today the project is the longest running elk study in all of North America. Results from this earlier research discovered key changes in migratory behavior. As the population declined, the number of elk migrating west to the Banff National Park decreased due to the risk of predation. More recently, elk have been moving east to forage in high quality managed timber habitat with prescribed burns. Interest in this concept of populations utilizing multiple migration options is growing in wildlife management. Now after a total 730 cows and 113 calves have been captured and collared, greatly advancing our understanding of population dynamics, predator-prey relationships and habitat use, the project’s first bulls have been added to the study. As bulls are the population segment that is actively managed, this new research will maximize harvest opportunities and bull quality, with benefits to elk management in the study area, Alberta and across North America. Another important aspect of the Ya Ha Tinda Elk Project is what project lead professer Mark Hebblewhite calls “the currency of people.” This project has been the epicenter of elk research for years and years. Many wildlife students have gone on from their experience to be North America’s leading elk biologists and managers. For more project updates and SCI Foundation news, like us on Facebook, follow us on Twitter and Instagram, like and subscribe to us on YouTube, or visit our website.